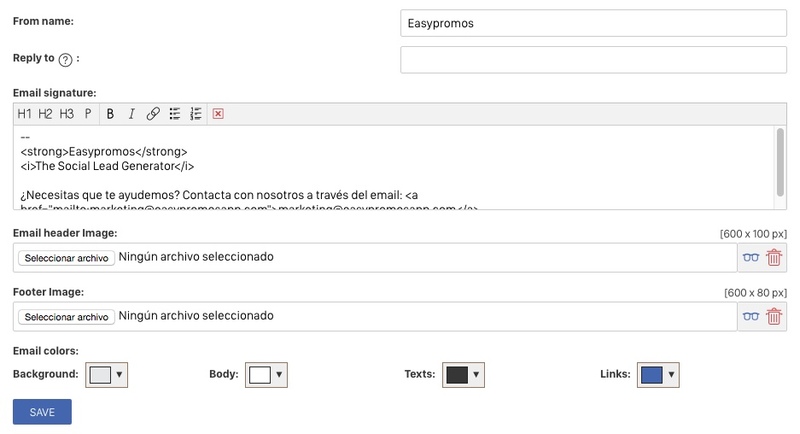 In Premium and White Label promotions, you can set up and send emails to participants. Add personalized smart tags, customize the email with images, and filter recipients to target your messages. Note: The Email Platform is not included in Basic promotions. It can be purchased as an extension for $50USD. Start in the Emails section. This is where you create emails for your specific requirements. This title will be displayed in the list of emails you create. Make sure it describes the purpose of the email, so you can find it again easily. Choose which type of message you want to send, and when. This can be on a scheduled date, in response to user actions, or whenever you decide to manually send the email. On registering: email participants as soon as they sign up for the promotion. On recruiting a new user: email participants when they successfully refer a friend. On getting a vote: email participants when someone votes for their competition entry. To validate vote: email participants when they have voted on competition entries. On validating the email: email participants to confirm their email address. Learn more with this tutorial. On scheduled date: email participants at a specific date and time. Manual: email participants when you choose. On Accept entry: email participants when their competition entry is accepted, if you have chosen to pre-moderate entries. On Reject entry: email participants when their competition entry is rejected, if you have chosen to pre-moderate entries. In the next section, you can choose who will receive an individual email. Note: If you added extra sections to the registration form, then you will also be able to filter participants by these fields. Choose the filter you want to use. Then set the condition and value. Press the green button to save. You can add as many filters as you wish. Subject: this subject line will appear in recipients' inboxes. Body: write the main text of the email. Use content and smart tags to personalize the content for each user. Attach documents: check which types of documents you can attach. When you insert a smart tag, it will be replaced with users' personal information in individual emails. So, for example, you can address email recipients by name, without having to create a separate email for each person. Username: Insert user's full name. First name: Insert user's first name only. Last name: Insert user's last name only. User email: Insert the email address which the user shared in the registration form. Recruiting URL: Insert a unique URL for participants to share with friends. My entry URL: Insert a link to the user's competition entry - for example, their contribution to a photo contest. Buttons to recruit: Insert share buttons for Facebook, Twitter, Whatsapp, Telegram, Line, or email. Buttons to share my entry: Insert buttons to share the user's competition entry onFacebook, Twitter, Whatsapp, Telegram, Line, or email. Voter username: Insert name of the person who voted for user's competition entry. Current votes: Insert number of votes for user's competition entry. Promotion title: Insert title of promotion. Promotion link: Insert link to the promotion. Email validation link: Insert link for users to validate their email address. You only need to use this option if you have enabled the email validation feature. Quiz summary page: Insert a summary of user's quiz answers. Prize: Insert a description of the user's prize. If the prize is a promotional code, then the code, barcode, or QR code will also be displayed. If the prize is downloadable, a direct download link is also displayed. Promotional code: Insert the user's prize code, with no further information. User picture: includes the photo uploaded by the user in the photo contest (support photofun). Note: If you added extra questions to the registration form, then you can also insert smart tags which use participants' answers. When you have drafted your email and click create, the email is automatically ready to be sent. If you don't want to start sending emails just yet, uncheck this box. You can also set up automatic emails to make sure that you receive notifications about the promotion's progress. Check the box "Do not send to participants. Send to a specific email." You can set up this option so that when certain conditions are met, the platform sends an email to let you know. For example, if you want to know instantly when a user gets a high score in a quiz, you can set up the email platform to send you a notification. On the Emails page, you'll see a list of all the emails you have created. Confirm and send for manual emails. Click this button to go to the email launch screen. Activated/deactivated slider button for automatic emails. When the slider button is green, emails will be sent as scheduled. When the slider button is red, emails are paused. 1. Send yourself a test email to check that everything’s correct. 2. Click Confirm and send. 3. Select Don’t send to users who have already been sent this email (optional). In the list of emails, you can check when the email was last sent, and how many times this email has been sent in total. Automatic emails include all email types: on registering, on a scheduled date, on recruiting, on obtaining a vote, and on validating an email. They can be identified by the activated/deactivated slider button in your list of emails. 1. Send a test email to check that everything’s correct. 2. Check that the slider button is activated (green). Use the Options section to create a single design template for all your emails. Then you only need to write the content for each individual email. Email signature: name and address of the company responsible for the email. You can use HTML code in your signature. Header image: attach a header image to give your emails a professional finish. The image dimensions are 600px by 100px. Footer image: attach a footer image to give your emails a professional finish. The image dimensions are 600px by 80px. Correct validation text: participants can click on a smart tag link to verify their email address. When they click through, they'll see the message which you write in this field.